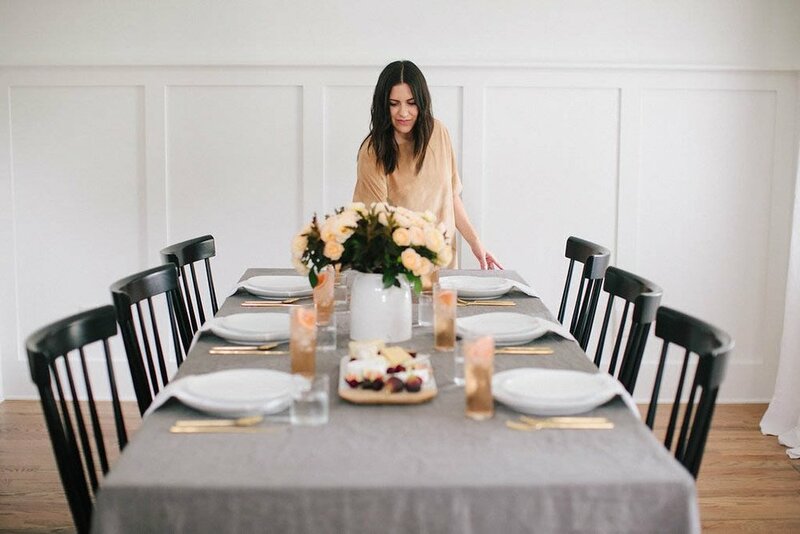 Earlier this year, the team at 12th Table started an editorial series called "How I Host" where we partner with creatives to design environments primed for entertaining. Hosting people is such a personal, giving act, and I love showcasing how different people not only set the scene, but serve. For this particular story, we worked alongside Alana Stipech. 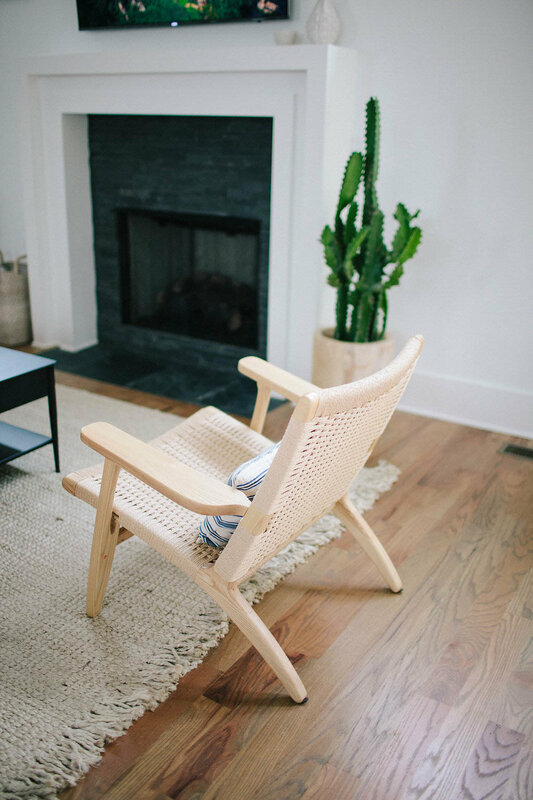 While Alana and her husband live primarily in New York, they own The Wendell Home—an Airbnb in East Nashville. I've always been drawn to the natural, calming aesthetic of her design, and was excited to collaborate with her on an entertaining specific space. Below you'll find a Q&A we did with Alana should it prove helpful! How would you describe your hosting style—5 words or less! Relaxed, conversational, attention to detail. Environment is key. What is your favorite space to host a party? Hosting feels very personal to me, almost as if it’s an extension of who I am. Most often I’m hosting in our little apartment in New York City. I always say the more the merrier, so sometimes everyone can barely fit but I just love it. When the weather is nice we move everything up to our rooftop space with views of the city. Do you have a signature dish or drink you like to serve? Our friends know we will always have fixings for a gin and soda, made with Hendrick’s. The garnishes of mint, juniper or a simple squeeze of citrus vary depending on the season. 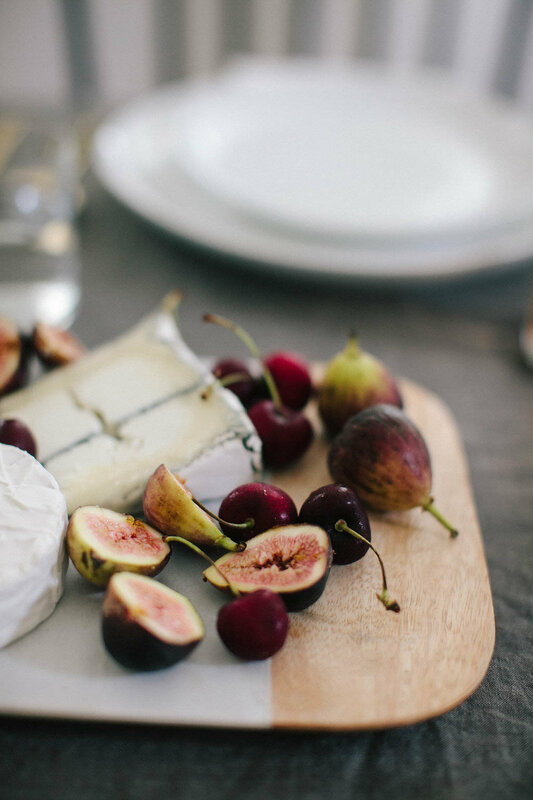 As soon as guests arrive, I put out a simple cheese board. If there are drinks and things to nibble on, no one notices if dinner takes longer than you expected. My go-to dinner is a whole roasted chicken with lemon and fresh root vegetables. The recipe is easy to prepare, always tastes delicious and the presentation is stunning. What's your go-to color palette for design? I love celebrating and embracing seasons so it depends on the time of year. I’m always drawn to neutrals but love layering with pastels in spring, bright hues in summer, and rich, dark tones in autumn/winter. With events, it's important to touch all the senses. The perfect playlist includes...? I’d love to share my table with some amazing women! All of my lovely girlfriends, as well as Martha Stewart, Alice Waters, Diane Keaton, Ina Garten, Shauna Niequist and Julia Louis-Dreyfus. What inspired your design for "How I Host"? I love florals. One of my dear friends is an incredible florist and I worked for her years ago before starting my own career. Now I buy inexpensive stems at the bodega down the street and keep fresh flowers in our home year round, so using them to decorate my table for guests comes very naturally. This table was inspired by some gorgeous peach colored garden roses that I found at one of Nashville’s local floral shops. I paired them with a darker foliage so that the arrangement wouldn’t feel out of place with the rest of the room. 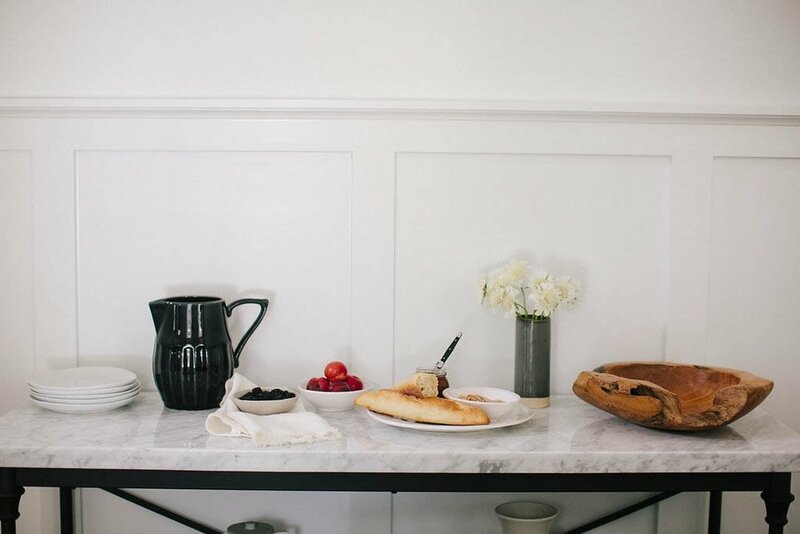 It was so fun designing this table at our Airbnb, The Wendell Home, because I hardly ever get to enjoy it myself! What pieces did you choose and why? I chose the organic white plates with white linen napkins. They look beautiful paired with the grey linen tablecloth. Gold flatware gave the table interest, and glasses in varying heights added depth. What's your best "hosting" tip for beginners? Think about your guests more than the stress of everything coming together perfectly. 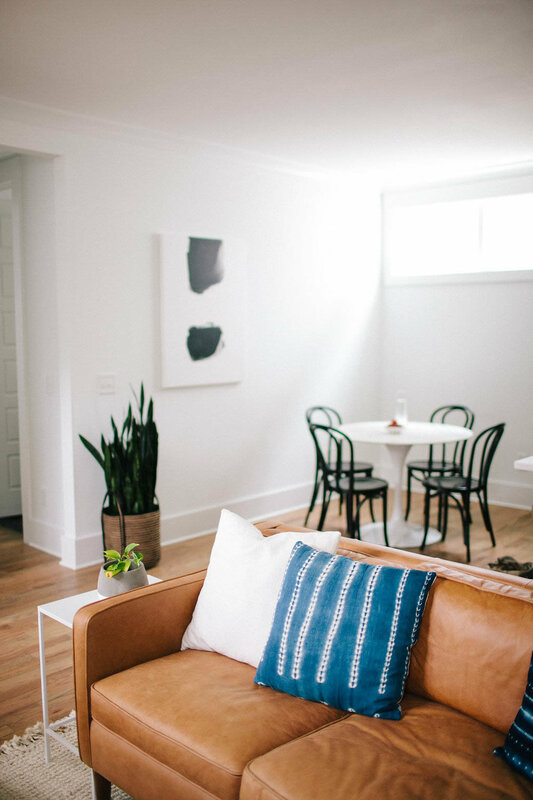 I listened to a talk by Shauna Niequist a few years ago, and it transformed my attitude about hosting. 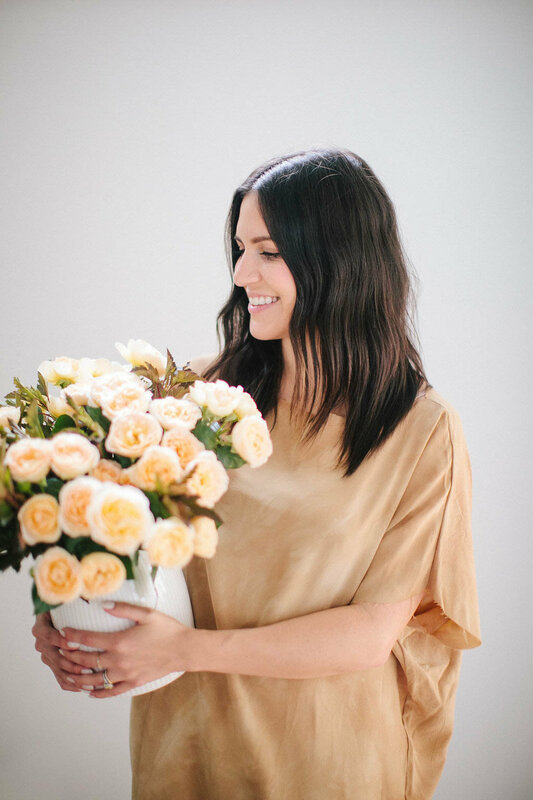 Essentially, she said that the goal of hosting is to create an environment for your guests to walk away feeling better about themselves, instead of being envious about how perfect your home/dessert recipe/life is. My husband Kristopher and I remind each other of that often before we host. We think about questions we can ask our guests and ways to make them feel cared for while they’re at our home. Your guests will remember wonderful conversation, thoughtful questions, and encouraging words far more than a perfect place setting!